Al Widing and Hailey McMahon as they near the finish of the 2012 Spike Challenge race. There is little to compare with the spectacle at the start of the annual AuSable River Canoe Marathon. Thousands of cheering fans line the river’s banks in downtown Grayling. Their collective din reaches a crescendo when the start gun goes off as racers run to the river’s edge carrying their canoes, primed for the 120-mile paddling adventure that finishes well after sunrise in Oscoda. Al Widing has been among the toned, young athletes for 40 years, so he’s the oldest paddler in pack. 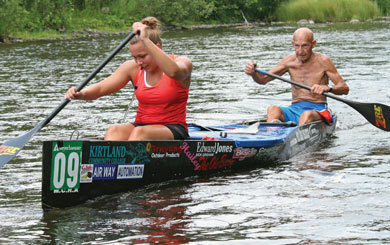 And when the 2013 AuSable River Canoe marathon begins July 27, the 88-year old Mio resident plans to be there again. “I am looking forward to it. I’d just love to finish,” says Widing in typical, understated fashion, conveying little sense of having become a legend in competitive paddling circles. Widing’s first AuSable marathon was in 1955, and he holds the record for being the oldest paddler to finish. His fastest race was in 1999 when at 74, along with Robert Bradford, of Lapeer, he set the senior division record finishing in 15 hours, 21 minutes and 22 seconds. Widing likes the challenge. The race requires extreme endurance, the ability to sit for hours paddling at a rapid pace, trying to edge out over 70 teams of top professional paddlers from around North America. The course winds downstream for 120 miles. The race goes on no matter what weather. Paddlers in the money keep a grueling pace of 60 to 75 paddle strokes per minute. They have to navigate in the dark and negotiate the river’s natural obstructions along with portaging around dams. “The toughest part of the race is when I have quit because (my paddling partner) is hurt,” Widing says while sitting in the comfort of his den in the home he built along the AuSable River. Widing lives there with his wife, Dorothy, his 12th grade sweetheart and mother of their six children. But Hailey McMahon knows another Al Widing. She is the 21-year-old nursing student from Grayling who teamed up with him for the 2012 AuSable Canoe Marathon. “It’s always fun and funny racing with Al,” says Lynne Witte, of Mt. Clemens. Witte is president of the Michigan Canoe Racing Association (MCRA), an organization founded in 1956 and built by Widing and others. 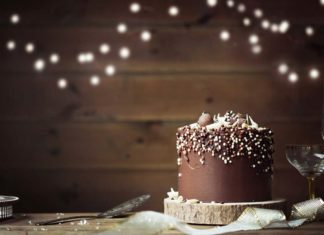 “He’s headstrong but not hard to get along with. I’ve paddled in the bow with him.